I know there is this Occupy Wall Street movement and what not, with the working class really frustrated at the way things have turned out for them, but still, there are some others who are above all that is going on below, living in their very own reality. Of course, this elite class have virtually bottomless bank accounts, leading them to be able to afford Christmas toys such as these – the $17,000 Bionic Bopper Cars. If you have watched Real Steel in the cinemas already, then you might be able to identify better. 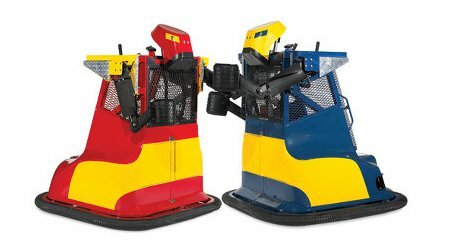 The Bionic Bopper Cars are actually motorized boxers which are controlled by a couple of drivers who do battle to deliver chin-lifting uppercuts for victory. Just like how bumper cars work, a driver (who should not weigh more than 300 lbs.) will sit inside the robot’s protective steel cage cockpit, where a thumb-triggered button on a couple of independent joysticks will activate the two pneumatic-powered, tire-tread-fisted arms. These arms throw a mean uppercut towards your opponent’s head, where a successful connect will net you a point in the process. Trust Honda to provide the gas engine which powers each robot’s hidden wheels up to 3 mph for forward, backward, and left and right spins. I wonder what’s the learning curve for this, and who is going to perform the repairs when they get all beat up?